This page is for educational use only! No commercial use! 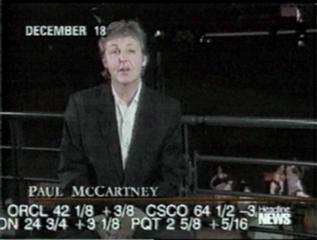 Paul McCartney was knighted by Queen Elizabeth II on Monday December 30th, 1996. The investiture ceremony took place on Tuesday March 11, 1997. Note that these links can be outdated very soon! Thanks to everyone in MACCA-L and RMB! LONDON (Reuter) - Former Beatle Paul McCartney, perhaps the world's most successful pop composer, was awarded a knighthood in the New Year's honors list announced by the British prime minister's office Tuesday. And in the week that the film version of his stage musical "Evita" opens across Britain, composer Sir Andrew Lloyd Webber was elevated to the peerage, allowing him to sit in the House of Lords. Lloyd Webber's hits include "Jesus Christ Superstar," "Phantom of the Opera," "Cats" and "Sunset Boulevard." Lloyd Webber, knighted for services to the arts in 1992, once employed Queen Elizabeth's youngest son Prince Edward in his Really Useful Group production company. He said he was "deeply grateful" for his latest honor. 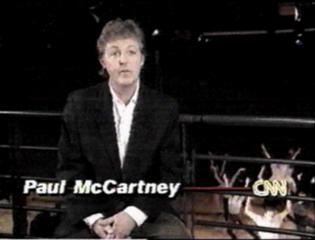 McCartney dedicated his award to his fellow-Beatles -- including his late song-writing partner John Lennon, shot dead by a deranged fan in 1980. The 54-year-old musician said: "It's a fantastic honor and I am very gratefully receiving it on behalf of all the people of Liverpool and the other Beatles, without whom it wouldn't have been possible." Actress Joan Collins, best known for her role as the bitchy Alexis in the U.S. television show "Dynasty," received an OBE (Officer, Order of the British Empire), while comic playwright Alan Ayckbourn was knighted. Author Frederick Forsyth, whose best-sellers include "The Day of the Jackal," becomes a Commander of the Order of the British Empire, which entitles him to add the initials CBE after his name. Liverpool poet Roger McGough, who played with The Scaffold in the 1960s with Paul McCartney's younger brother Mike McGear, also receives an OBE. Racing driver Damon Hill, the current Formula One world champion, was given an OBE for services to motor racing. Oarsman Steven Redgrave, who won his fourth Olympic gold medal in Atlanta, was awarded a CBE to add to the relatively humble Member of the Order of the British Empire (MBE) he already possesses. In the world of soccer, Arsenal's David Seaman, regarded as one of the world's top goalkeepers, also becomes an MBE. The honors system, a holdover from the days when Britain still had an empire, remains firmly entrenched in British life despite Prime Minister John Major's pledge to create a classless society. The Beatles' producer, George Martin, received a knighthood last year, but none was granted at that time to members of the group, which disbanded in 1970. McCartney has continued as a prolific songwriter, releasing 23 albums since the Beatles' breakup. Along with his fellow Beatles, he was awarded an MBE in 1965. Officials stressed that the honors list is not just a means of rewarding "the great and the good." Among the more than 1,000 people commended this year are a road repair worker, a newspaper seller and a waiter. LONDON (AP) -- Rise, Sir Paul. The former Beatle was knighted Tuesday as Sir Paul McCartney, when Queen Elizabeth II bestowed New Year's honors on Britons famous and obscure. ``I hope I can be worthy of it,'' McCartney said. Musical extravaganza composer Sir Andrew Lloyd Webber (``Phantom of the Opera,'' ``Sunset Boulevard'') became a baron, and ``Dynasty'' star Joan Collins, was honored as an Officer of the Order of the British Empire. Author Frederick Forsyth, whose best-sellers include ``The Day of the Jackal,'' became a Commander of the British Empire. The Honors List is compiled by the government although the queen presents the awards personally. Many of the 1,035 awards went to lesser-known Britons, including royal gamekeepers, police, social workers and waiters. YESIRDAY: Paul McCartney becomes a Sir in the New Year's Honours, capping an incredible career which has made him the most successful pop star of all time. DUB ME DO: Legendary ex-Beatle Paul McCartney is knighted in today's New Year honours list. SIR MACCA: Paul McCartney is made a knight in a tribute to the music-makers of Merseyside. SIR PAUL ARISES AND SIR ANDREW RISES AS SHOWBIZ GLITTER IS SPRAYED OVER NEW YEAR HONOURS: The composer Sir Andrew Lloyd Webber becomes a lord this morning and Paul McCartney, his cheerier rival in Britain's flourishing musical export market, becomes Sir Paul as part of a 1.035-name New Year's Honours List sprinkled with show business glitter. A HARD DAY'S KNIGHT FOR McCARTNEY: A knighthood for the former Beatle Paul McCartney and a life peerage for Sir Andrew Lloyd Webber are among a cluster of high-profile showbusiness awards in the New Year's Honours List published today. FORMER BEATLE IS KNIGHTED IN GLITZY HONOURS: Paul McCartney is knighted, Andrew Lloyd Webber gets a peerage and Cilla Black becomes an OBE in an unashamedly glitzy new year honours list today. Both the BBC and ITV television news broadcasts this morning led with the news of Paul's knighthood. 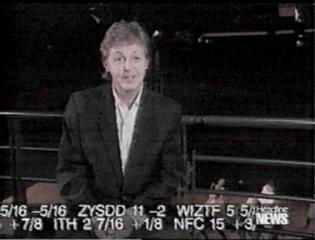 They showed a video of Paul at LIPA, looking very smart in a black watch tartan jacket, saying the words quoted in all the newspapers: "It's a fantastic honour and I am very gratefully receiving it on behalf of all the people of Liverpool and the other Beatles, without whom it wouldn't have been possible. I hope I can be worthy of it. I'd like to thank my wife and kids and wish everyone a happy New Year." Phil Collins: "I'm sure Paul will be extremely happy with the honour. He has played an unforgettable role in shaping the way we are today. The Beatles may have started out as musicians but like it or not they changed the world. I think it's a little off balance though, not to include George and Ringo as I assume this is more of a 'lifetime contribution' honour." Rod Stewart: "I'm absolutely delighted for him. It couldn't happen to a nicer man. He thoroughly deserves it. I'm really envious!" Bruce Springsteen: "Great, great news. Paul has done more for the business than any other." An aide to Michael Jackson said: "He is delighted Paul's hard work and talent have been recognised." Bette Midler: "It's a long overdue recognition of a powerhouse talent." Billy Joel: "We're overjoyed - but he's already a peer in US music circles." Spice Girl Mel C (from Liverpool): "Paul is a hero in Liverpool and it is wonderful news for the city. He is an inspiration to everyone and it is great that he has been honoured in this way." Mike McGear: "I'm thrilled, but I've promised our kid that I wouldn't say anything until after the official announcement was made." Freddie Garrity (remember Freddie & The Dreamers in the 60s? ): "It could not have happened to a nicer person." Carla Lane (Liverpudlian TV comedy writer, famous veggie animal lover and friend of McCartneys): "I don't think he will be calling himself "Sir Paul" from now on. He's not that type. Fame and fortune have never changed him, so why should a knighthood? But next time I go to his house, I'm going to take my own bit of red carpet, drop to my knees and pay homage to "Sir Paul"!" Liverpool comedian Stan Boardman: "I suppose we will have to start calling him Macca The Knight now! It is great news and means a lot to me and the people of Liverpool. The whole place will be rejoicing at this news." Peter Sissons (ex-Liverpool Institute school pal of Paul and now BBC TV newsreader): "His knighthood is overdue. He is the most talented musician of his generation." Cilla Black (who also received an honour - an OBE): "It's brilliant news and a great day for Liverpool. I wish we could be together to celebrate." Ringo Starr's son Jason: "Dad will be chuffed. I expect he'll want one now!" By the way, Roger McGough, famous Liverpool poet, ex-Scaffold member and writer of "Lily the Pink" got an OBE. The Times' front page declared "McCartney is knighted in glitzy honours", with a large picture of Paul, an article inside with a picture of The Beatles and a section in the editorial comments. The Mirror - "Dub Me Do" - has good photos and, like The Sun, quotes other stars' reactions to the news. The Daily Express - quite good, not the major headline on front page, but a banner at the top. Good editorial comment and a page-long article by Philip Norman (writer of the book Shout). "In one of the few interviews he has given in recent years, McCartney said "There are a lot of people who don't value anything and that can lead to serious problems, like drug addiction, because there is nothing else for them to try. People find it hard to accept that I am an ordinary bloke because I have a lot of money. But my family, honesty and loyalty and the three most important things in my life." The Telegraph: Front page headline "A hard day's knight for McCartney" with large photo of Paul and Linda. The Guardian: Front page headline and picture, mention in the editorial comment, but in more of a political vein than actually praising Paul. Many thanks to Lynn Douet for her kind permission to use her posting on this webpage!. Many thanks to L.II for the TV snapshots.